Thirsty Pilgrim: How a Couple of Really Interesting Beers Are Made. How a Couple of Really Interesting Beers Are Made. L'Enfant Terrible and bottled Oude Faro from De Cam are the subjects of our discussion today. A couple of new, hard-to-find, sourish Belgian beers made in funny ways. The first one, from the still excellently named Dochter Van de Korenaar--I told you how fun that beer is. But I had no idea how it was made, besides the label's vague clue that it is a "gueuze-style ale brewed with wild yeast." Based on taste, my guess was an ale blended with Girardin or other lambic and allowed to mature. As usual, when it comes to me guessing about these things, I was wrong. 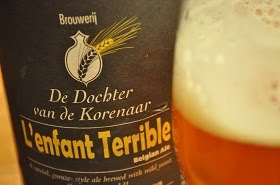 L'Enfant Terrible is an odd beer. The basic beer is Bravoure, my smoked beer. After about two to three weeks fermentation as Bravoure the beer is transferred to oak wine barrels, where the beer is infected with lactic bacteria and Brettanomyces (both are local). Then, in four to six months the beer undergoes a lactic fermentation followed by a wild fermentation. Smokey esters are changed into fruity esters by the Brettanomyces, which is a mystic and wonderful process. Then the beer is bottled by hand, and gets a refermentation of about two months. 'European Beer Star' this year. About the smoky esters that go into a cocoon and emerge as beautiful butterfly fruity esters... pretty weird, right? I can vouch for it, as far as not noticing smoke. Oaky, yes. Smoky, not so much. But I've had the Bravoure a couple of times and, while fairly subtle, it is definitely smoky. So much of that smoke just disappeared in a puff of, er, fruit. I don't want to give you the wrong idea about L'Enfant Terrible. It had a rough edge and could use some refinement... The oak might have been a bit much, and there was some alcoholic heat. But it was a very tasty beer and damned interesting and I would buy another bottle given the chance. Next: Bottled De Cam Oude Faro, about which there have been whispers, scant photographic evidence, and a small number of reviews. I itched my scratchy head when I heard about this one. De Cam is a traditional little blendery. Bottled faro implies non-traditional corner-cutting nonsense. It implies pasteurization and/or artificial sweetening, basically. The background: Faro denotes aged lambic with candy sugar added. 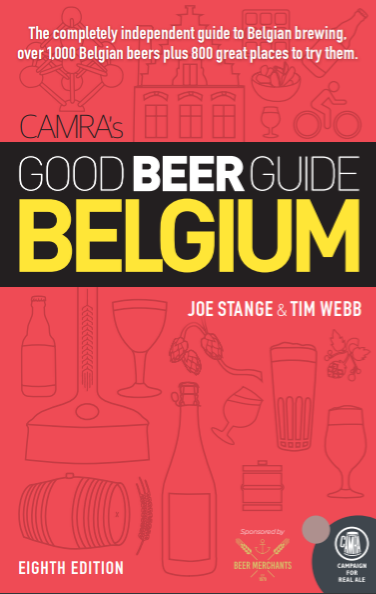 In hundreds of Brussels and Pajottenland cafés around the turn of the century (no, the other century), that often meant lambic from the cask and sugar from the little bowl at your table, stirred up with a spoon. But when you try to bottle that, the wild critters chomp on the sugars and churn out enough gas to make exploding bottle bombs. Hence the trickery. I'll say it plainly: If the only faro you've had has been from bottles, then you still haven't had faro. For the real thing you'll need to book a trip to Brussels. And you should. Digression over. I contacted De Cam blender Karel Goddeau. At first he was reluctant to let me write about it, as "we are only starting to experiment with it." I told him the cat's out of the bag and that it might be useful for lambic geeks to know that this one's a work in progress. So he relented. Here's what Mr. Goddeau is up to: adding candy sugar to "very old lambic" and waiting to see what the wild critters do with it. In other words, they are fermenting the sugar and leaving behind a bit of extra flavor. He said the bottled beer should be nearly flat, "almost not foaming." In his words: "I try to get it in the bottle the same as on draft on beer festivals, but I need to convince more then 99 other micro organisms to share my opinion." Is there a common thread here? Maybe. Remember these two beers when someone says unthinkingly that Belgian brewers do not innovate. They do. But they do it at a different pace and within a different framework than anyone else. At times, it might as well be another dimension. Oude Faro was available on the De Cam bar at this year's Brugs Bier Festival. It was an excellent drink and I'm kicking myself for not asking Karel Goddeau if I could buy a bottle to take away (actually I didn't deliberately not ask, I forgot to ask which is worse really).